Clutter, be gone! Putting up a pegboard is a simple, satisfying project that will give you a place for pretty much anything, so you can (at last) put everything in its place. Does it look like a bomb went off in your workshop? Even the best tools are useless if they are nowhere to be found when you need them. Hang pegboard for a quick and easy tool storage solution that can be scaled to fit just about any space, whether it’s the nook above your workbench or an entire garage wall. Measure the width and height of the area where you plan to hang the pegboard, then calculate the number of furring strips you’ll need (they should be spaced every 16 inches). For example, if your width measurement is 96 inches, divide 96 by 16 to find that you’ll need 6 furring strips. Cut the required number of furring strips to the height measured in Step 1. Fasten the furring strips at 16-inch stud intervals along the wall. Make sure they are secure and flush to the surface. Pegboard typically comes in 4′ x 8′ sheets, so you might very well need to cut yours down to size. Using a jigsaw, circular saw, or table saw, trim the board to the dimensions desired, then screw it onto the furring strips. 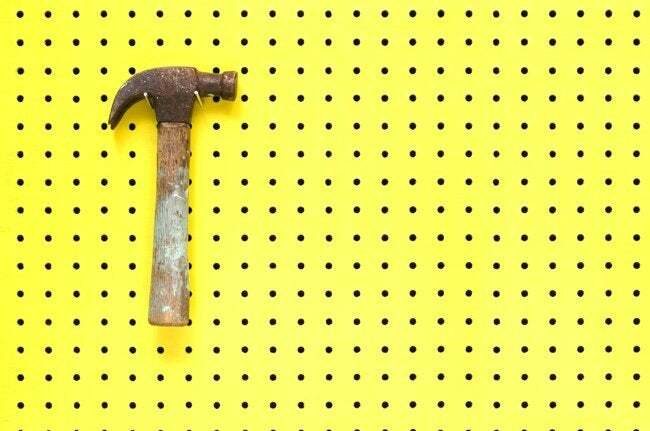 If you’re installing an expanse of pegboard, screw in one panel at a time. Decide what type of hardware to attach. Sold in sets, pegboard hangers vary in size and design to accommodate virtually any tool in the handyman’s arsenal. It may be helpful (or even fun) to lay out the tools you want to store on the pegboard, trying them out in different arrangements. 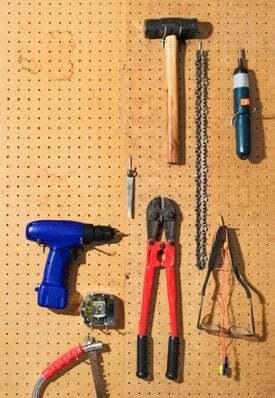 Add your chosen hardware to the pegboard and, finally, set your tools into place. Once they’ve discovered the perfect configuration, some people like to draw an outline around each tool so that its correct placement won’t be forgotten. To each his own—customization is central to pegboard’s appeal, after all!